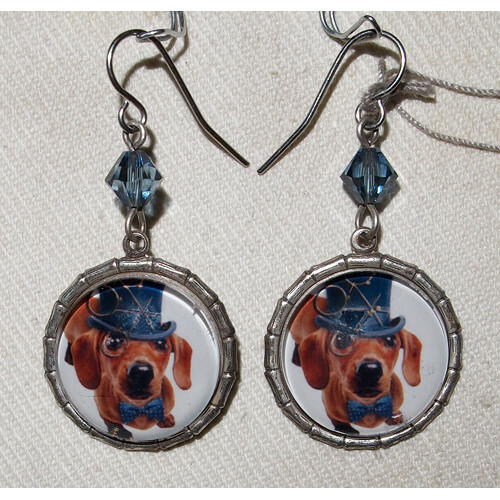 Order Dachshund Short Hairedd in Top Hat Earrings from Unicorn Design, made of brass with surgical stainless steel earwire. Dachshund Short Haired Cameo with dog head in high hat in true steampunk style. The cameo is 20 mm big. The earrings are decorated with Swarovski crystal beads in the color Light Azore. These earrings are for pierced ears and they have French hooks of surgical stainless steel. The length of the earring is approx. 35 mm and width 25 mm.